Android is the hot phone platform, with market share growing at a rapid pace. Handsets with the OS being touted across the web. I've been impressed with how far Android has come in a relatively short time. How well it's penetrated the market. Windows Mobile has seen recent updates, an all-too-infrequent occurrence. Is often getting bashed for being a dated smartphone platform. I've dished out my fair share of criticisms about Windows Mobile, largely due to being such a longtime enthusiast who's grown jaded. I set my cynical attitude aside and compared WinMo with Android. The fact of the matter is, WinMo is better than you might think. When you compare the two platforms in the major areas that matter the most, the results may surprise you. When you talk about what makes a good smartphone, some key abilities are usually mentioned. The ability to run many apps at the same time, multi-tasking, is always at the forefront of such discussions. The number of apps available for a given platform is a hot topic. The user interface is also right up there in discussions about phone platforms. And you can't overlook the ability of a platform to integrate with the user's computer desktop, as comments across the web bear witness. Let's break down these major abilities and compare Android to Windows Mobile to see how each fares. Android is often touted for its ability to run multiple apps at the same time. My experience with Android phones bears that out –. it's a seamless experience running many tasks at the same time. The OS does a good job handling the resources each app needs as it's running. It makes sure that any app running in the foreground gets the attention it deserves to provide a good user experience. What's rarely mentioned in the press is that Windows Mobile is an excellent multi-tasking platform. It's probably not mentioned because WinMo has always been good at multi-tasking. The OS has no problem with tasks running in the background –. In fact, it's designed to handle them with aplomb. WinMo automatically changes memory allocation based on the needs of each app. If the system memory starts to get stretched thin, the OS shuts down background tasks automatically. The user is rarely aware of these system adjustments that are happening all the time. That's the way it should be. WinMo has long been criticized about multi-tasking due to the lack of an app close option. Apps don't shut down by default when exited. They still run in the background. Some users aren't used to such behaviour and find that to be an undesired feature. Sure, an app developer can include an exit option expressly. Many feel that should be the default action of the OS. Guess what? Android operates exactly the same way. When the user leaves an app to start something else, the first app keeps running in the background. In a familiar way, an app developer must include an express option to shut down an app when exited. Anyone who's run an Android phone for more than a few minutes should fire up a task manager and have a look. You'll likely see 20 or more tasks running in the background, not unlike WinMo. WinMo actually has a big advantage over Android in one area of multi-tasking. that's how the OS handles user installed applications. WinMo allows them to be installed to either system memory, which can be in the hundreds of megabytes. On external memory cards such as SD, microSD or miniSD cards. This makes it possible to install an almost unlimited number of apps on a Windows phone. Android has a huge limitation when it comes to user installed apps. They can only be installed to system memory. Even on the latest and greatest Android phone, the Droid, that's only 256MB. When the system memory gets full, no additional apps can be installed. That's not even enough storage to install a good game. Android will remain seriously hamstrung until this insane app install limitation is addressed in future versions. We're hearing a lot about the 10,000+ apps available in the Android Market. it's an outstanding achievement that there are so many apps in such a short time. it's definitely an advantage that the Android platform has evolved so quickly. While Android has only a fraction of the apps that one can find for the iPhone, there are many good ones to meet users'. Needs. Microsoft was late getting to the app store game, with the Marketplace just recently opening its doors. Not a lot of apps are in there yet, which isn't surprising given how new the store is to the market. What's rarely discussed are the tens of thousands of apps already widely available for the Windows Mobile platform. The advantage of an app store is bringing apps into one central location, which makes it easier for customers to find them. Windows Mobile apps have always been sold through a variety of outlets. Customers have to do a little homework to find the app they need. There almost certainly is already a WinMo app to meet virtually every need a user might've. Search around a little. 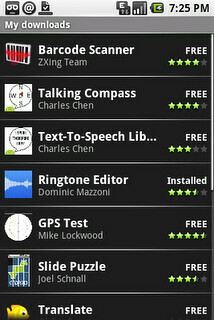 New WinMo owners will likely be amazed at the number of apps already available. The quality of them. Most WinMo developers have been producing apps for a long time. Those applications have evolved over time as apps often do. That means that many apps for Windows phones have grown over time to be robust and complete. Android's web browser has been widely acclaimed for being much better than the latest version of Mobile Internet Explorer. that's an accurate claim. Many view this as a big advantage for the Android platform. There are already a number of good third-party browsers for Windows Mobile. While it'd behove Microsoft to get the browser included in the OS to be more competitive, it really doesn't matter for users. Opera Mobile 10 is as good as any mobile browser out there on any platform. it's free for Windows phone users. it's so exceptional that HTC has been using it as the default browser on its WM phones for years. With good reason. It demonstrates the quality and quantity of apps available for the WinMo platform. While this is just the web browser application, the same can be said for many application categories. There is usually a good WinMo app to fill a user's needs. I've been as vocal as many in lamenting the old, tired interface on Windows Mobile phones. The lack of innovation in the interface design is really showing its age. Android is currently better in that respect. The primary difference between the interfaces of the two platforms is that Android is a new OS. Thus, has been written for finger manipulation. it's easier to interact with. It looks more modern. This is why the Android interface is often thought to be the better of the two. When you compare the two interfaces, you begin to realise that both of them are simple icon-based “launchers.”. The icons for apps and tasks are organised in launcher screens for easy (and sometimes not so easy) access to fire things up. Android is cleaner and easier to interact with. Out of the box I must give it the nod. You can't compare interfaces without looking at third-party alternatives. It's the only fair way to compare the two platforms. Android phones with the stock interface are pretty plain Jane, as is the WinMo interface. The magic happens on both platforms when you start adding third-party interface shells, such as HTC Sense, that transform Android into a very capable interface. HTC has long produced its own interface for WinMo phones, too. The latest Sense interface, such as found on the HD2, is amazing. It does for WinMo what it does for Android –. Adds a highly customizable face on the OS that makes it work the way the user prefers. HTC Sense works in a similar fashion on both platforms, although optimized to take advantage of each OS'. Strengths. The end result is that a WinMo phone running Sense is as good as an Android phone running it. The advantage that WinMo has over Android gets back to the third-party app scene. There are other shells already available that turn a WinMo phone into a user customizable dream interface. Spb Mobile Shell has been out for years. The latest version is for WinMo what Sense is for Android. The difference is that Mobile Shell is user obtainable, where HTC Sense must be installed on a phone as purchased. That means that WinMo phone owners have the option to put a sophisticated interface on their phone. Customize it to fit the way they prefer to work. Many consumers expect, no, need their phones to integrate with their desktop computers. They need a simple way to keep the phone's contacts, calendars, tasks and email in sync with their desktop environment. For millions, this means syncing the phone with Outlook on the desktop. Windows Mobile wins in this scenario, hands down. it's designed from the ground up to integrate with both Exchange Servers in the corporate world. With Outlook environments on the desktop. All aspects of desktop Outlook commingle happily with Mobile Outlook on the Windows Mobile side of things. On the other hand, consumers who have their desktop environment built around the Google cloud will no doubt find Android to be a better fit. The installed user base of Google services such as Gmail has grown steadily. It's big. Android is designed around integration with the Google cloud. it's the obvious choice for those consumers. The hot platform of the two is definitely Android. Windows Mobile still has a lot to offer. While criticized for being an ageing platform that's been around seemingly forever, the evolution of the WinMo ecosystem is, in fact, an advantage. If only Microsoft would make that clear.